The Canadian Ski Patrol (CSP) is a national non-profit organization that provides advanced first aid services to over 230 alpine and nordic ski areas across Canada. Our organization was founded in 1941 when the Canadian Amateur Ski Association (CASA) made a request to our founder Dr. Douglas Firth, to organize and train a first aid rescue team to patrol ski hills. Since then, the CSP has grown to approximately 4,300 volunteers that provide advanced first aid services on and off the ski hill. Our organization is divided into nine divisions, with each division divided further into multiple zones. Currently, we provide advanced first aid services at Hidden Valley Ski Area and Arrowhead Nordic Ski Club in Huntsville, Ontario during the winter ski season. We also provide first aid services year round at events such as the Ontario Winter Games, OFSAA, Tough Mudder, Iron Man Triathlons, and more in our Muskoka Communities. If you require first aid services for your event, contact us for more information. We are a group of individuals with an interest in first aid, a passion for skiing or snowboarding, and a drive to give back to our community. We are teachers, engineers, technicians, real estate agents, nurses, students, chefs, business owners. We range from young students who are interested in gaining first aid skills to enter the medical profession to retirees who wish to keep active and be part of a social group. We’re more than just a group of people who provide advanced first aid. Some of our patrollers would define our group as a family. We ski and snowboard together, create events to make patrolling and skill training throughout the season more fun and exciting, have pot-luck dinners on occasional evenings, and social gatherings outside the ski hill. 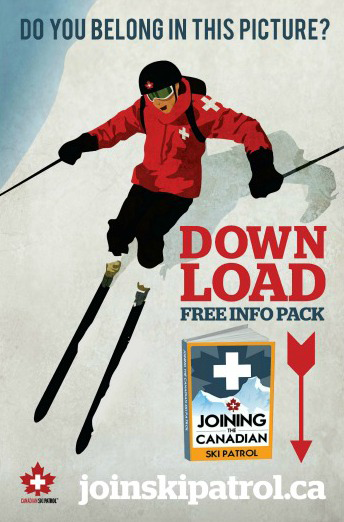 Whether you want first aid training for work or out of interest, are new to an area and want to meet new people who ski or snowboard, or you just want to give back to your community, the Canadian Ski Patrol could be for you. Join Us! Joining the Canadian Ski Patrol (CSP) takes a great deal of time and commitment, but the rewards can be vast and expand beyond being a Ski Patroller at your local ski area. Our advanced first aid course can lay the groundwork for entering into the professional medical field. A commitment to performing a certain amount of patrol shifts encourages activity during the winter months, and improves your ability in your chosen snow sport. Volunteering your time and abilities gives a sense of giving back to your community. What’s is your CSP First Aid Course Like? The CSP Advanced First Aid Course must be completed in order to learn the skills required to be an effective first aid provider with the CSP. The course is divided into equal parts theory and practical hands-on learning. This course is required regardless of any prior medical background. The instructional portion of the course is comprised of forty-eight classroom hours over three weekends and trained by fellow ski patrollers. The testing portion of the course is comprised of twelve hours over one weekend. A written first aid knowledge test and practical examination of skills is required to pass this course. How does it work once you are on snow? On-Snow instruction covers protocols and procedures for applying first aid skills to a ski area environment. Instruction is covered during your first shift as a ski patroller. Completing the on-snow training in conjunction with the successful completion of our advanced first aid course will qualify you to wear our CSP jacket and become a full member of the Canadian Ski Patrol. Time committed is determined in shifts. Patrol shifts can be anywhere between 10-14 shifts depending on the amount of patrollers enrolled for that year and the operation schedule of the ski area. Do I Need To Be A Skier To Join? Not at all. We welcome Skiers, Telemark Skiers and Snowboarders to our Alpine Patrol and Cross-Country Skiers to our Nordic Patrol. In fact, you don’t even need to be a skier to join. We could always help with our four seasons events off the ski hill. Yes, there are fees to get started with the CSP. Annual dues are used to fund the organization, purchase insurance, print first aid manuals, and purchase first aid supplies and jackets. Subsequent annual dues can be offset by volunteering for CSP fundraising events. Do I Also Need to Buy A Ski Pass? For committing your time to help our local ski area in providing first aid services, you will receive a ski pass in exchange for completing your required number of shifts. This makes the cost of joining the patrol more affordable. Note that joining the ski patrol does not entitle you to a pass, and that ski passes are subject to be revoked at any time by the ski area for any reason. Do I Have To Do The Full Course Each Year? No, each subsequent year you will be required to complete a sixteen hour refresher course as well as testing and evaluation. You can get started by visiting our national volunteer site where you can get all the facts and more in joining our team. Sign me up! You can also contact our recruit officer directly to get more information.